KIEV, Ukraine -- The European Parliament has extended through mid-November the mandate for its team working on the release of former Prime Minister Yulia Tymoshenko, a newspaper reported Tuesday, citing European Parliament President Martin Schultz. 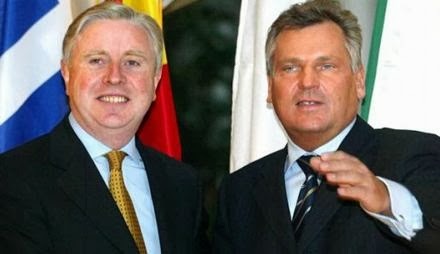 The team, led by former European Parliament President Pat Cox and former Polish President Alexander Kwasniewski, was originally supposed to stop its mission in mid-October. The move underscores last minute efforts by the European Union to give Ukraine more time to remove an important obstacle on the way for the country to sign the political association and free trade agreement with the EU on November 28-29. The decision to extend the mandate for the team comes after Cox and Kwasniewski have reported some progress that had been achieved by the Ukrainian authorities in tackling the issue of selective justice. The European politicians use ‘selective justice’ wording to describe what they believe to be politically motivated trials and jailing of Ukrainian opposition leaders. Although several lower level opposition politicians have been released over the past seven months, such as former Interior Minister Yuriy Lutsenko and former Acting Defense Minister Valery Ivashchenko, Tymoshenko’s imprisonment may eventually derail the signature of the agreements, several European officials have warned. The decision to extend the mandate of the team was announced by Shultz after the Cox-Kwasniewski team’s report, Ukrayinska Pravda reported citing Schultz. Carl Bildt, the foreign minister of Sweden, tweeted on Tuesday that the team’s report showed that Ukraine had yet to show key progress to qualify for signing of the agreements. Cox and Kwasniewski earlier this month delivered an appeal to President Viktor Yanukovych to release Tymoshenko for medical treatment in Germany on health and humanitarian grounds by way of pardon. “Our appeal comes at a time of strategic importance for EU-Ukraine relations,” Cox and Kwasniewski wrote in an Op-Ed published by Kyiv Post. “In this context, we believe this mission should continue its efforts in order to facilitate the implementation of a mutually acceptable solution before the decision by the Council of the European Union on a potential signature of the Association Agreement,” Cox and Kwasniewski wrote. Tymoshenko on October 4 officially accepted a proposal from Cox and Kwasniewski for medical treatment in Germany. But days later, on October 10, German Foreign Minister Guido Westerwelle, following a meeting with Yanukovych in Kiev, said little progress was made in securing a quick release of Tymoshenko. European commissioner Stefan Fuele on October 11 said that Yanukovych would have to free Tymoshenko to be sure that the Ukraine-EU agreements are signed.